so you can be assured in finding the right solution to fit your needs. 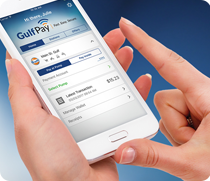 Gulf Pay is a fast, easy, and secure way to pay at the pump or in-store directly from the convenience of your smartphone. With Gulf Pay, you can find nearby stations, access reliable directions and pricing, pay by phone, and receive exclusive digital offers on your favorite products. 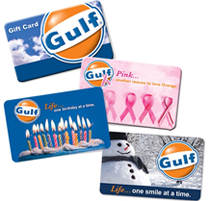 Gulf Gift Cards make the perfect gift for any occasion. Our gift cards are available in four designs and in any denomination from $5 to $250. 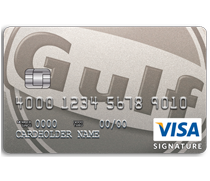 The Gulf Visa Card allows you to earn points every time you use your card - at Gulf stations and everywhere else. 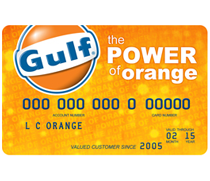 The Gulf Card offers pay-at-the-pump convenience at all Gulf stations, and boasts $0 fraud liability and no annual fee. It is a great way to build credit! 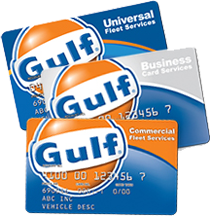 Gulf's Fleet Fueling Cards offer a simple and easy solution for managing your fleet vehicles and company drivers. Each program offers unique benefits to provide the best savings.